If you are ever struggling to define the term Americana to an uninitiated observer, there may be a solution at hand. Just quit the talk and get them to listen to this 30 minute EP from Philadelphia based band The Miners, titled MINERS’ REBELLION. At the end, that person will be none the wiser on the jargon we use but their ears will have been exposed to as clear a musical definition as you could find. The core 4 piece band led by vocalist, guitarist and songwriter Keith Marlowe along with his percussion colleague Andy Shahan, have managed to create a sound that perfectly fuses country and indie rock in the true style set out by Gram Parsons all those years ago. This is no homage to the stadium rock being courted by the mainstream just the vibrancy of good honest down to earth garage rock n’ roll given the golden coating of sublime pedal steel. This is certainly a fine example of alt-country being played at its best. David Thornburgh provides the regular pedal steel guitar but he is joined on a couple of tracks by fellow practitioner of this fine instrument in session player Jim Callann. Scott Donnini on bass completes the core line up with guest fiddle coming from Joe Kille. 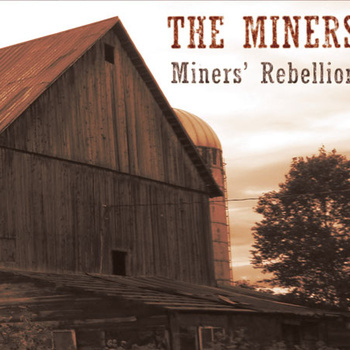 All six tracks are meaty efforts with the fusion of crashing guitars and pedal steel greeting you within a few bars of the opening tune ‘Miners’ Rebellion’. The band shows that within their great sound they can combine storytelling and meaningful lyrics with this historical account of a West Virginian industrial conflict. There is definitely more of a traditional country feel to the second track ‘I Recall’ where the strains of fiddle are introduced to ramp up the roots sound. This song contains some memorable instrumental interludes in its second half and succeeds in hitting the right spot. The third track ‘Doggone’ is yet more pedal steel driven bliss amidst a heartfelt account of an absent one. With so many candidates for top track on this debut release, it is tricky to choose but if pushed you wouldn’t go far wrong with the nostalgic ‘Norton’s Pond’. Not surprisingly Marlowe and the boys continue the twang theme, in a slightly anthemic five minute recollection of a lost place, that stills holds fond memories in the mind. It would certainly be an effective set closer for any Miners’ live show. This short but highly impressive release heads towards its finishing line with a more up tempo number ‘W.T.A.’ where the band tackle domestic difficulties with the inevitable ultimate conclusion, all delivered in a frenetic style. More crashing guitar leads us into the album’s finale ‘Cold Steel’ where an armed robbery is continually referred back to in the repeated line “cold steel against my head, one slip and I’d be dead”. There may or may not be a vibrant alt-country scene in Philadelphia but this release by The Miners shows that high quality music is bubbling under the surface. If they so desire, there is a market ready to embrace them in the UK and Europe but this may require a visit one day. In the meantime enjoy this fine album and if you ever need to explain the term Americana, you know what to do.